I’m not sure if this is a metaphor or not. I usually don’t go looking for a metaphor for life. But, often, as I think about what I’ve observed, I can apply it to life. 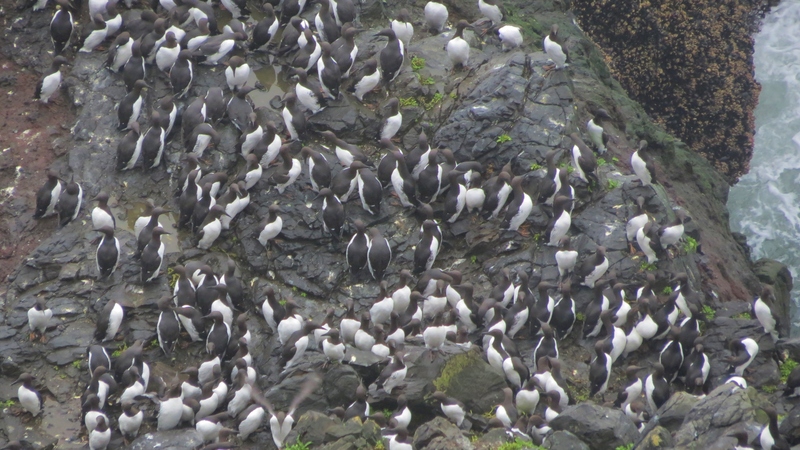 The smaller birds with more white on them is the Common Murre. The larger ones with the long neck is the Brandt’s Cormorant. But LOOK! With the naked eye I think I see something blue? Sure enough! 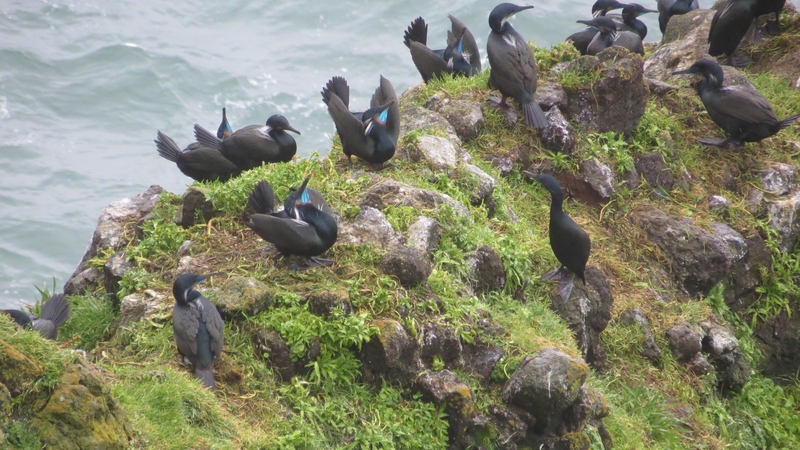 It’s breeding season and the male cormorants are displaying their striking, blue, chins to attract the females. 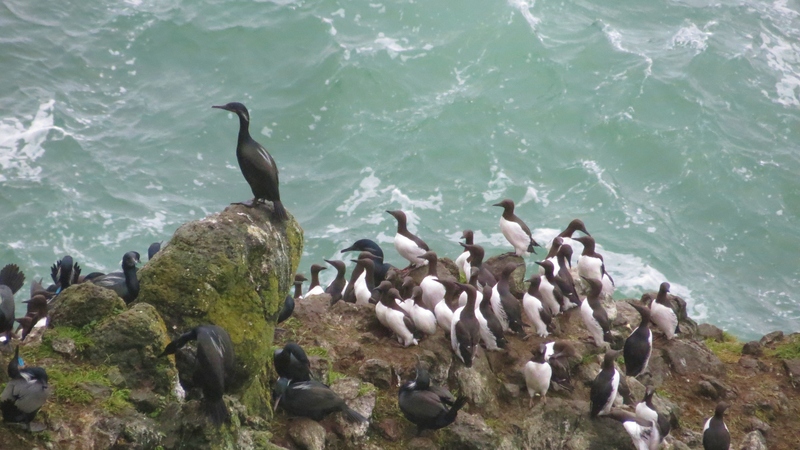 Cormorants and murres share the same general nesting areas. The male cormorant gathers materials and brings them back to the female for her to make the nest. So I look over another edge and see a different black and white bird. But LOOK! With the naked eye I think I see orange feet? It’s the Pigeon Guillemot. The little bit of a black bar on the white wing distinguishes the Pigeon Guillemot from the Black Guillemot. 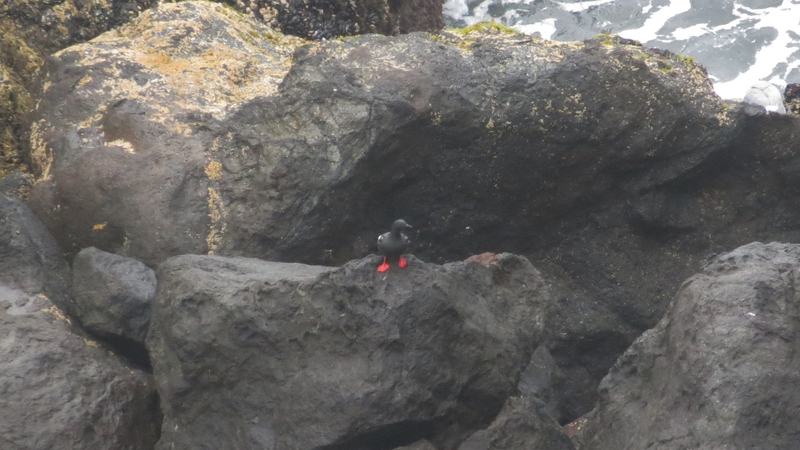 Pigeon Guillemot – Where’d you got those shoes! See, if you really pay attention, things are usually not ALL black and white. 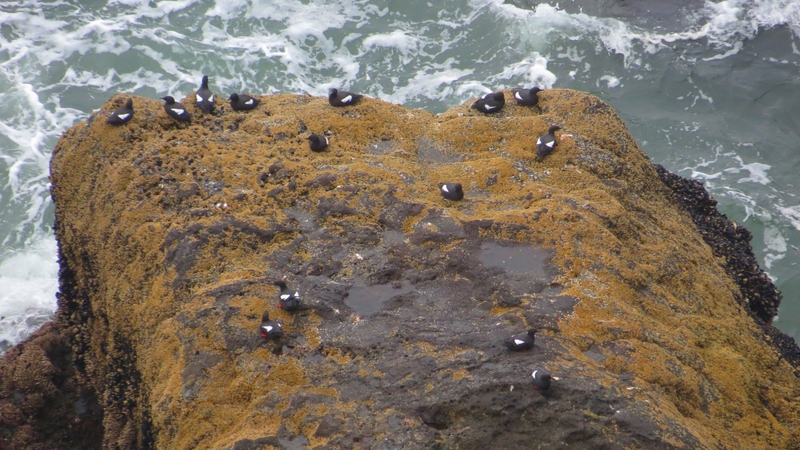 …except maybe the Common Murre? But, then, maybe I just need to look closer? I heard it was pupping season on the Central Oregon Coast so I went out on the Alsea Bay Bridge to take some pix. Apparently this pod of seals give birth later in the spring than some other pods because I did not see any suckling pups. They are weaned at about 4 weeks old and I noticed that I took those pix the first week in June last year. So, that means the pups are born in late April or early May. An indicator that seals are being born is the increase on vultures and eagles flying overhead. As I was taking pix of the seal nursery a couple days ago I was watching a mom and pup in the water. He was very vocal. He started whining when he was in the water. I figured he was hungry. They hauled out at the upper sandbar, just on the east side of the Alsea Bay Bridge. I got busy taking pix of the others while she and her pup moved further onto the sand. Then I noticed the tag and tried to get a clear shot of it. I snapped the shot then looked on the camera display to zoom in. I can see it says ‘A175’. 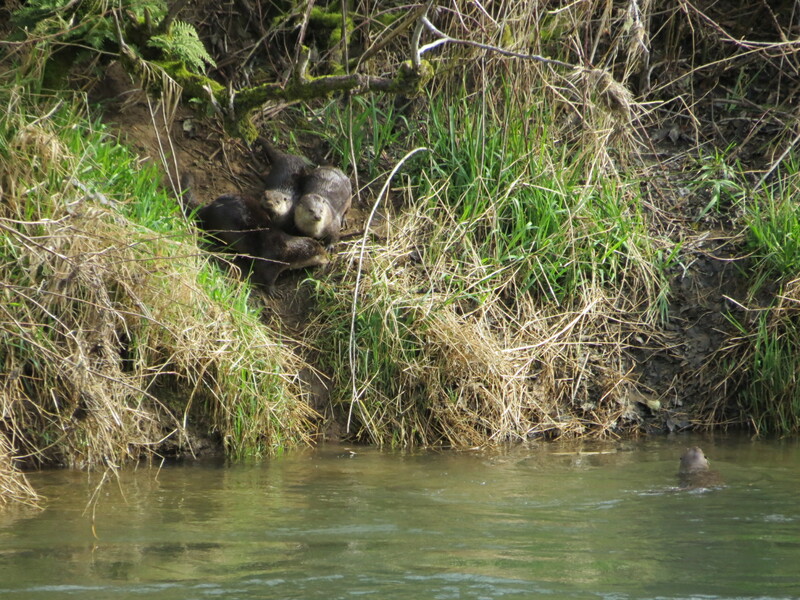 The slide show isn’t very big so here’s a bigger photo of the Alsea River Otter family. Photo taken near Blackberry Campground, Tidewater, Oregon, Hwy 34. I saw one of the beavers dragging a big limb through the water this morning. I grabbed my camera but he’d disappeared by the time I made it back to the window. So I watched and either he or another appeared near our bank. I’ve seen 3 at one time on other days. To my surprise he started coming up into the yard! I opened the window so I wouldn’t have the glass to interfere with my auto-focusing “skills” – hahaha – Although the low light interfered plenty. When he got near the house, I think he must have smelled me. I understand they can’t see very well but they have a very keen sense of smell. 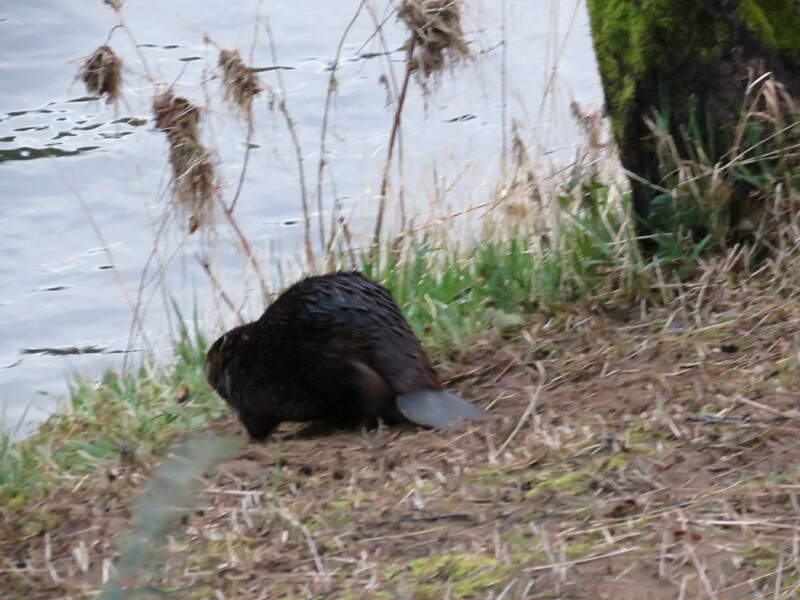 He raised up on his hind legs, sniffing the air, then turned and ran (waddled) back down the bank. He went into the water and smacked the surface with his tail as he dove under! Yup, he sniffed danger and he warned his buddies. 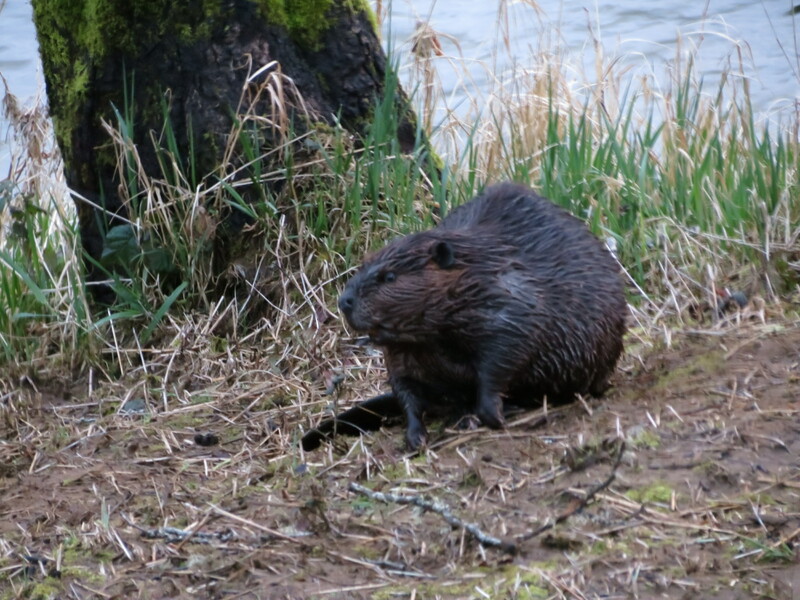 But there’s no radio transmitter on his tail so he’s not one of the nuisance beavers that were relocated to the Alsea River by OSU. That was a couple years ago, so maybe this is a descendant? 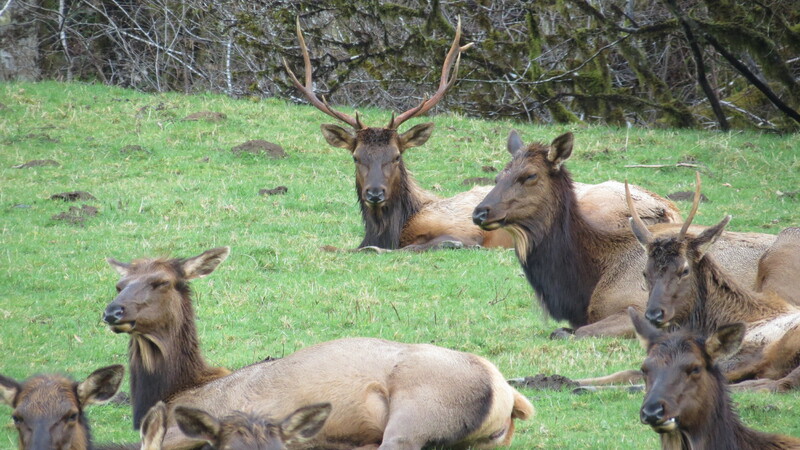 Oh yeah, we saw the head of the elk herd today too. Bull Elk – Nice Rack Buddy! Later, when we drove by again, the two bulls were sparring. I got a photo but it was too fuzzy to post. Man, you gotta be quick with wildlife! We took a drive in the RV to dump the holding tanks and have a picnic on a beautiful January day. 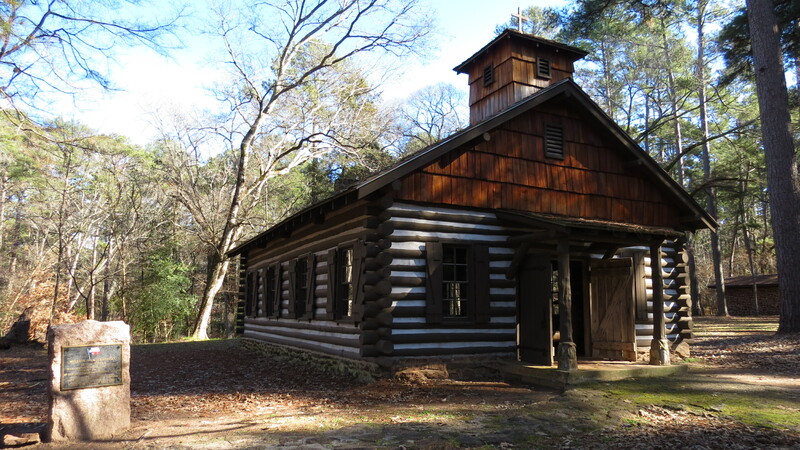 Mission Tejas State Park is on Ratcliff Lake in the Davy Crockett National Forest. It is on Hwy 21, the El Camino Real Hwy (King’s Hwy), between Crockett and Lufkin, TX. I was researching camping prices for you but they are so complicated I decided just to provide the above links. Besides, there’s a lot of great history that I’d probably blow if I tried to summarize it. I am actually a little confused, now, about whether we were in a State Park or the National Forest. Or maybe it’s a State Park in the National Forest? I don’t know who runs what, but that’s why I gave you the links. You can sort it out for yourself (if it matters). The dump station was closed but we didn’t let that ruin our day. 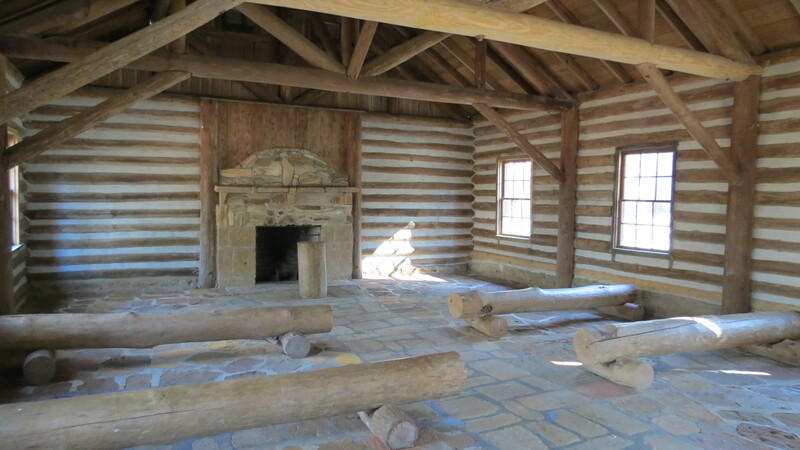 We stopped to take a look inside this beautiful little log church: Mission San Fransisco de los Tejas. 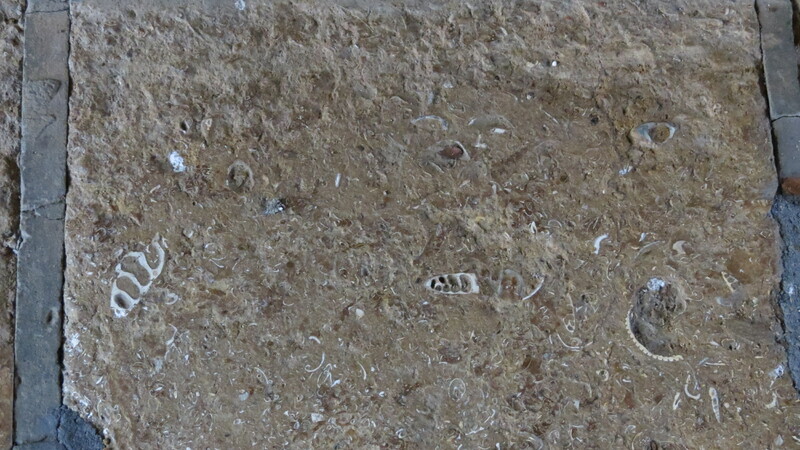 The floor has fossils in locally quarried stone. Most (or all?) of Texas was under water eons ago. 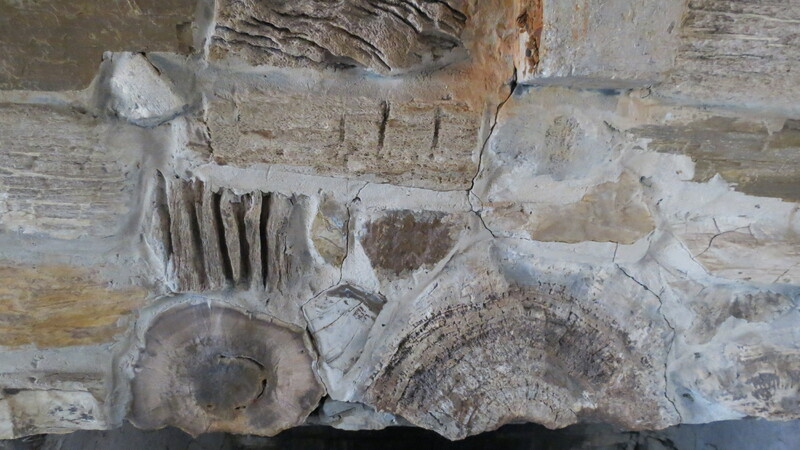 We thought the petrified wood for the fireplace was really a nice touch. For our picnic, we went over to the Day Use Area on Ratcliff Lake. 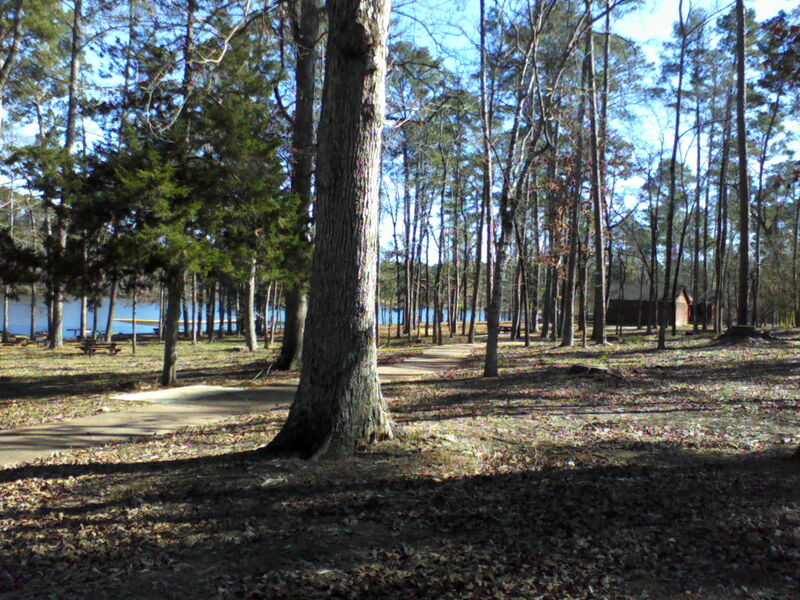 There is a nice swimming beach, lots of picnic tables and a nice pavilion for groups. They do use workampers here because I saw they’ll rent the FHU sites to RVers when they aren’t occupied by the Camp Hosts. But I don’t know if they are paid or volunteers. I’ve been wanting to see the full moon for 3 days but the weather hasn’t cooperated. The skies were very clear this afternoon and into the evening. So I knew I’d get a chance but wasn’t sure what time moonrise was. I was anticipating it since sundown and it finally came around 7:50. It had to rise above some low clouds on the horizon but that gave it the nice orange color. This is over Houston County Lake near Crockett, TX. I had to go buy some short-sleeved shirts so I didn’t have a heat stroke. 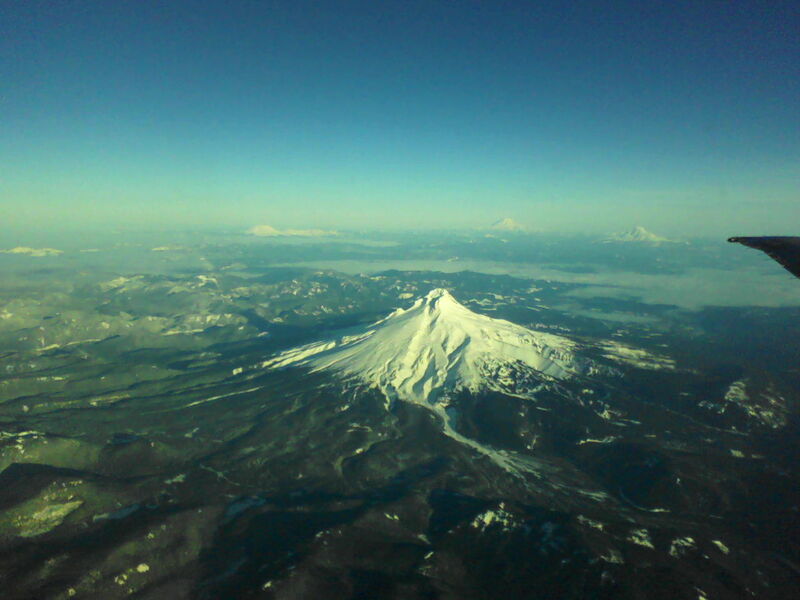 The skies were clear as a bell when we took off from Portland International Airport (PDX) last week. Mt Hood is gorgeous, eh?